I finally took the time this summer to read a book on Scala. I bought Programming in Scala by Martin Odersky, the father of the language, which I think was a good choice. Regardless whether I'll write a lot of Scala programs in the future I learnt some new general programming techniques and a well needed recap on programming language fundamentals from school. After reading it and applied it on a couple of hobby projects I must say that I feel excited. My first project to play around with the language is a photo collage creator where you supply the program a motive and a set of images to create a collage from. The algorithm tries to puzzle the images together to create a collage that best fits the motive. The motive to create collage from. 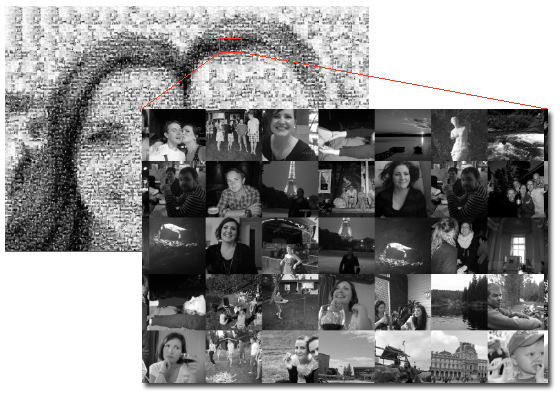 The motive is divided in segments and the image catalogue is searched for best fitting images to puzzle together. The final collage in low-res. When printing the collage in high resolution, for example 16384 x 10922 pixels the effect becomes quite cool when you approach the collage from a distance to a near closeup. Let me just show you an arbitrary Scala function in this program that demonstrates a few of the things that I like compared to my daily work horse Java. 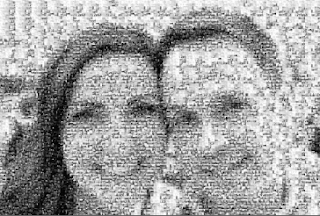 * Calculate the average brightness of a portion of an image. * @param img Image to analyse for average brightness. * the aggregate of their calculated values. As you can see, Scala is statically typed, but the compiler tries to infer as much as possible. You can create a constant variable with the val keyword. But it will in this example figure out that the variable aggregatedBrightness must be of the type (or subclass) Int since it is evaluated via the function estimateBrightness(). You will save yourself a lot of boilerplate declarations. But what about the function estimateBrightness? It is declared inside the scope of the function brightness(). In Scala a function is on par with any plain old objects and can be referenced via variables or passed as arguments to functions and also be declared inside functions as a consequence. Why wouldn't it always be so? Everything has a value, even a for loop or an if clause will result in something that can be passed to a variable or statement. This makes for concise and beautiful code. Scala is basically a functional language but with all the imperative concepts around to make it easy for imperative people like me to make the transition to a more functional style in the tempo that suits me. In this example I made my calculations in a functional style using recursion instead of using loop constructs. I tried to write the program without any for or while loops at all but my conclusion is that just because it is nice to make everything recursive and functional it must not inherently be readable and understandable. I'll stick to my imperative guns when I need them for some time more. An interesting annotation is @tailrec on the local function declaration. It forces the compiler to verify that this recursive function will be tail-call optimized, meaning that you can be sure that this function will not create stack frames for each invocation in the recusive loop. If so you would be running out of stack after some 10 000 invocations depending on your JVM startup flags. To be able to write efficient and understandable functional programs my impression is that the requirements of the programmer are heightened compared to programming in plain old Java/C/C++. A challenge I'm gladly willing to continue with. Instead of me trying to convince you that Scala seems like a great contribution to the Java VM family I strongly recommend you to read the book. You'll definitively become a better C# or Java programmer as well afterwards. If you want to play around with the Photo Collage creator program and generate som collages of your own clone the code from GitHub. 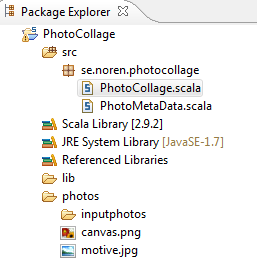 I have used Eclipse with the Scala plugin which make the program run without any hazzle. To configure it without any code changes, create a directory photos in the module, and put one image in that directory as your motive and name if motive.jpg. Put all your images that will be part of the puzzle in a subdirectory called inputphotos. Run PhotoCollage and monitor the standard out until the program is finished. Run time depends mainly on the number of images in the directory inputphotos.